My undergraduate studies at Carleton allowed me to explore my interests in ecology and entomology. Passionate professors, a friendly and supportive learning environment, and opportunities to conduct research both locally and overseas all helped to confirm that I was doing the right thing for my future. Courses with hands-on laboratories and outdoor field studies gave me the practical experience I needed to later conduct my own research as a graduate student. Now I’m enjoying the beginning of my dream career as a scientist and educator. Carleton is a leader in experiential learning, an innovative approach to education that emphasizes hands-on experience and the Biology program offers a major that can be tailored to students’ interests and career goals. Our graduates are well-qualified for opportunities in medicine and the allied health sciences, basic and applied research, industry or government, and graduate programs in the biological sciences. Many of our courses feature instructional laboratories and extensive opportunities for hands-on lab work. As a result, our graduates are recognized for their excellence in laboratory and field skills. At Carleton University, class sizes, especially after first year, are kept low so that each student can receive the personal attention they need from their instructors. View all undergraduate program options. In Biology at Carleton our students learn biology by doing biology – 80% of Carleton Biology students participate in undergraduate research and there are abundant opportunities to do so. Here you’ll have the opportunity to study with Biology’s faculty of engaged, award-winning scientists whose expertise spans five major areas of biology: Biochemistry and Physiology; Ecology, Evolution and Conservation; Genomics and Bioinformatics; Molecular Biology and Genetics; and Neurobiology and Behaviour. All Biology faculty members work closely with undergraduates in designing and implementing research projects in virtually every area of Biology. Many of our student researchers are paid for such activities with funds supplied from research grants from either Carleton or external government and private agencies. All Honours students have the opportunity to develop an Honours Research Thesis, working alongside a faculty adviser. You will graduate with valuable experience using some of the most up-to-date methodology, as well as a defined area of expertise. Students in Biology degree programs can participate in field courses that take advantage of our unique proximity to an unrivaled variety of natural habitats, and are encouraged to see the importance of both field- and laboratory-based research in the development of a well-rounded biologist. ecological features of the Amazon rainforest or the Florida Everglades. Carleton University students have the opportunity to study and research abroad through Carleton International. Students in Biology at Carleton have access to state of the art facilities and high-quality, modern instrumentation and equipment in teaching labs as well as in research labs. We constantly seek out and use funds to equip our labs, and we emphasize training students on how to use this instrumentation so that they can compete for entry into graduate and professional programs, as well as the scientific and technical job market. The Biology department is well-equipped with the latest technology, including a mass spectrometer; fluorescence and light microscopes; cell, tissue and bacterial culture facilities; a wide range of molecular biology equipment; sophisticated electronic sensors for physiological and behavioural studies; and computer laboratories. The Nesbitt Biology Building houses an aquatics research facility, controlled-environment rooms and growth chambers, and extensive greenhouses. Carleton students at Parliament Hill. The Ottawa area has a considerable number of environmental and biotechnology companies which are available to Carleton students for collaboration on research or for co-op opportunities. Several government departments are involved with the research that leads to environmental legislation and regulations, and over 100 companies are conducting research in medical, agricultural, and environmental biotechnology. 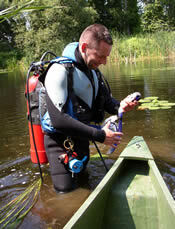 The National Wildlife Research Centre laboratories are also situated at Carleton. 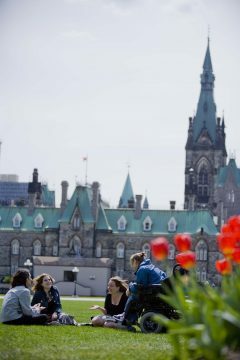 Connections with these organizations, as well as with the National Capital Commission, national museums, and the National Research Council Canada, provide an unparalleled background for your study in Biology.